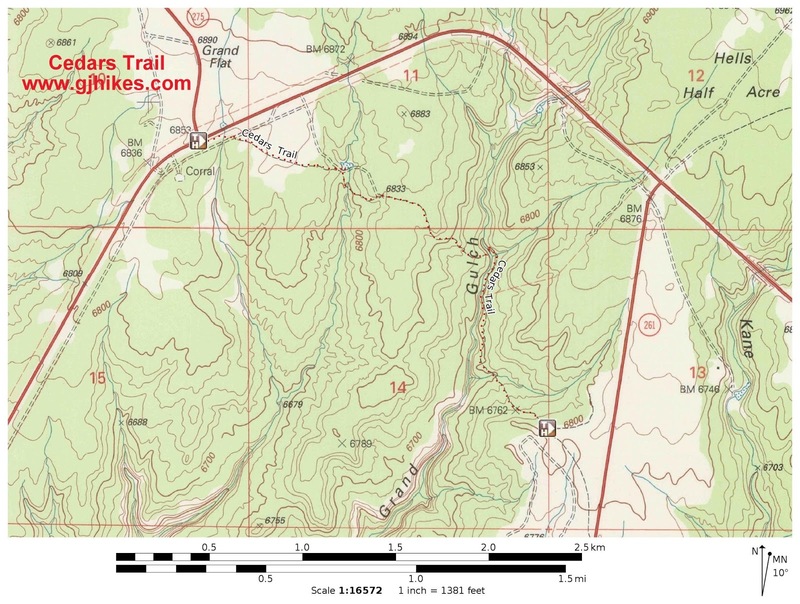 The Cedars trail is located in the Grand Gulch/Cedar Mesa area west of Blanding, Utah. The trail begins at the junction of Utah Highway 95 and Highway 275 which leads to Natural Bridges National Monument. From there the trail heads eastward, parallel with Highway 95, for 1.3 miles to where it crosses the Grand Gulch. After that the trail begins climbing for another 0.7 miles until it comes to an end about a half mile before reaching Highway 261. The Cedars trail is a segment of the longer Hole-in-the-Rock Trail used by Mormon pioneers in the 1800's that reached from Escalante to Bluff, Utah. To get to the trailhead drive west on UT-95 for just over 30 miles. The parking area is on the left side of the highway across from the turnoff to Natural Bridges National Monument. There seem to be several routes to follow as the trail begins. One is right next to the highway and the other is just inside the trees. Once you find the first trail marker, which is a post with a covered wagon, the route finding becomes much easier. After a short distance there will be a place with a ladder to climb over a fence where the trail continues to the left. On the other side of the fence watch for the spot where the Cedars trail branches off on the right. There is a hiking only trail marker after a few feet. If you were to miss the turnoff the two trails eventually reunite but you would traveling along the highway most of the way. As you continue down the trail you might notice quite a few shards of pottery. The trail appears to have crossed right over the site of a basketmaker era pithouse. After crossing the shallow wash of a branch of the Grand Gulch the trail goes over a hill where the main channel of the gulch starts coming into view. The trail descends toward the gulch until if comes to a place that was easy enough to get wagons across. The Grand Gulch gets dramatically deeper downstream from the crossing. After crossing the gulch the trail has a mostly uphill trend to it. If you manage to stay on the correct route there will be another fence ladder. The Cedars trail comes to a rather inglorious end just under a half mile from Highway 261. 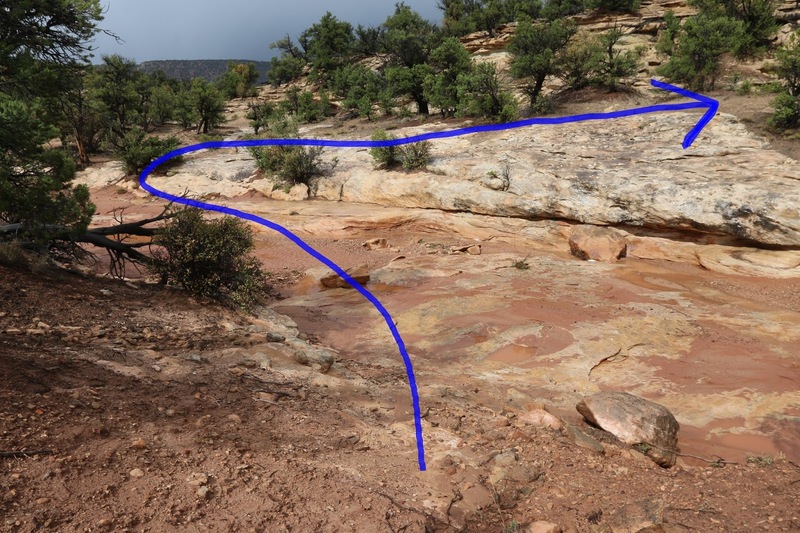 It was at this point that the original trail turned to the right and continued on across what is called Mormon Flat. 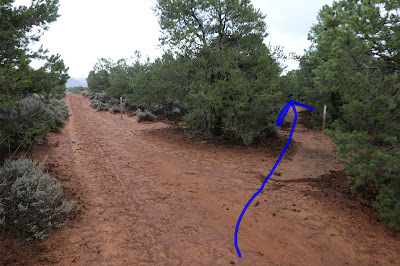 There is a singletrack trail going to the left that runs on out to the highway where there is a hiking trail marker. At one time the trail appears to have continued on the opposite side of the highway leading to the campground. There aren't any good pullouts along Highway 261 so it's kinda difficult to start from there. On the day that we took the photos for this post it was raining and had been for several days. 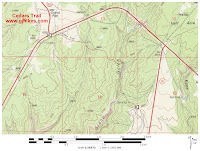 All of the roads leading to other places that we wanted to hike were too muddy to travel so we hiked the Cedars trail. The trails sandy surface sucked up water fast enough that there wasn't much in the way of mud to worry about so it turned out to be a good rainy day hike. We never got around to hiking down Grand Gulch from where the trail crosses it. At some future date it would be nice to see how far we could go before reaching a spillover. The Cedar Mesa trail doesn't have the types of ruins that most visitors come to the area to see but it can be interesting nonetheless. If you would like to see it for yourself then all you have to do is 'Take a hike'.